Sticks of mallee and banksia snatched at my over-large pack and ripped at my shirt. I was wrestling through shrubbery that closed overhead, old and tall because it had not seen a fire since the vast blazes of the 1950s. I was glad that the old walkers’ pad still parted the bush at leg height just enough to get through. I was just as pleased that the track had grown no deeper or wider over the decades I had known it. No bush ‘philanthropist’ had felt the need to go chopping at the scrub, as they have in other places. 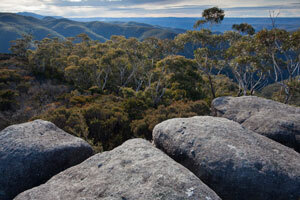 A sandstone edge appeared ahead, and I burst out onto Pindari Top, still not far from the Kanangra Walls road. 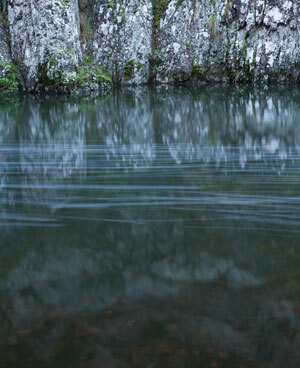 Cool water filled little hollows, as I expected it would after rain the day before. In winter such pools last for a few days at least. The air had turned chill again after a brief Indian summer, and a shivering wind blew lumpy clods of blue-and-white cumulus from the west. They passed overhead and evaporated into the east. The forecasters had backed off on chortling predictions of snow. A ca-cough-ony of wattle-birds cackled across the heath, and yellow sprays of wattle were beginning to appear. I swung my pack down and slurped at one of the rain-pools. Soon spring would be upon the bush, and the rolling waves of windblown she-oak would shed their rusted winter colours, busting with chlorophyll and new life again. I turned to look over the Kanangra-Boyd Wilderness, the second largest wilderness in NSW, a fiefdom of the wombat and the lyre-bird. The Blue Breaks ranged blue and gold across the eastern horizon, standing up bright in the clear sky. 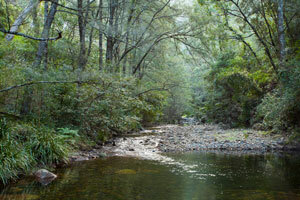 This is now the most remote country in the southern Blue Mountains, since Warragamba Dam flooded the Burragorang Valley in 1960 and cut off access from the east. Closer, but still beyond the wide blue gulf of the Kowmung valley, Mount Colong’s flat top of basalt rose above the humbled plateau tops. There are many fine and roomy places to go walking in the Greater Blue Mountains: the Wild Dog Mountains, Blue Labyrinth, Grose Valley, Gardens of Stone, the Colo River and vast Wollemi. 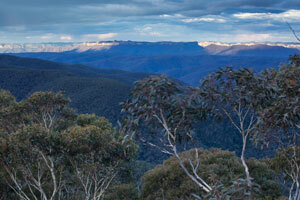 But the Kowmung holds an iconic place in bushwalking, and in the landscape and history of the Blue Mountains. Perhaps only Blue Gum Forest exceeds the Kowmung’s aura. 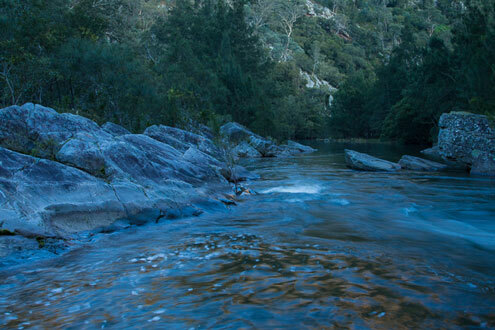 The river begins its named journey where the Hollanders and Tuglow rivers meet, gathering waters from the Central Tablelands and diving straight into the first of three long gorges on its way to join the Coxs River and Lake Burragorang. For some 80 km it wends through a crinkled, blue-ridged wilderness of sandstone, granite and metamorphics, gathering clean water and strength, weaving a rich tapestry of terrain and life. 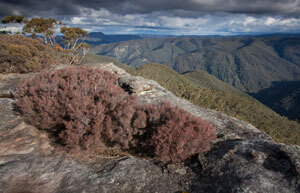 There’s something talismanic about the Kowmung: any Blue Mountains walker needs to touch it now and then. Some people have walked the entire length of the river. Not me. I still have at least 30 km to see. But in nearly 40 years I’ve walked in and out of the Kowmung by two dozen different routes. That’s the way I like to do it. But somehow time slipped by and it became many years since I had visited the middle reaches. I needed to fix that, to settle an old score, and capture some river photographs. I crossed Pindari Top and was soon stepping awkwardly down the fern-muffled chasm of Wallaby Pass. When last I passed this way I was young, with indestructible knees. Of course I didn’t appreciate any of that then. I also carried much smaller cameras. Striding through the forest along the crest of the Colboyd Range was easier, despite the efforts of the ‘big wind’ four weeks earlier. The ground was strewn with a shredded confetti of bark and leaves; broken limbs and whole trees snapped off waist high were flung across the track, becoming faint now. Those trees had been thriving up there for a long time. With the day nearly gone, I wasn’t walking far. Scrambling around the cliff-edge of another sandstone top, I began to doubt the reliability of that younger self. On his map he had noted some ‘two-star’ overhangs for overnight shelter. I finally found them, but had to scrub a star. Such an optimist, he must have been. And I was counting on the notated ‘deep rockholes’ for water. After a tussle with some dense scrub across the top, I found the pools, all good, and an expansive afternoon view over Christys Creek to the Kowmung watershed on the Murruin Range. The lack of grinding grooves on the rock platform suggested that even the Gundungurra came rarely to this place. 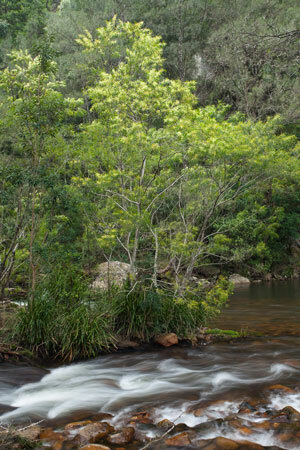 Christys is one of the largest Blue Mountains’ streams entirely contained within national park, with a clean catchment. It was almost certainly amongst the waterfalls below me where Francis Barallier’s gutsy attempt to ‘cross the Blue Mountains’ had foundered in 1802. He was so close to the Boyd Plateau, and success. It was a windy, fitful night in my one-star cave hotel. 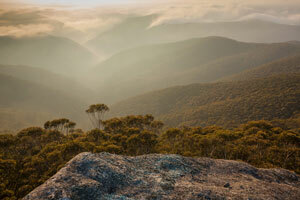 At first light I was working through the bush again, back to a remembered viewpoint on the northern tip of the mountain. It didn’t look promising, with an overcast sky. A five-second explosion of rising sun burst through then it all went gloomy again. By mid morning I was heading for the river, watching for the mis-step that would lead me astray down to Mount Great Groaner, and turned along the main ridge to Mount Le Tonsure. Such names. And they had wit too, those pioneer walkers. Although Le Tonsure must have changed, because there was no sign of a fringe topped by bare pate. Maybe it’s in the wrong place, I wondered, like so many names applied before topo maps were made. When Myles Dunphy and his friends walked here in the early 1900s, they had to come in from Burragorang Valley in the east, or from Jenolan Caves. There was no Kanangra Walls Road, just a cattle track joining Burragorang to Oberon across the Kanangra Tops and Boyd Plateau. I had lunch on Arabanoo Peak, under a grove of singing she-oaks (the wind-whisperers of the bush). Then, since I had walked this ridge a few times before, I took a new spur direct into Arabanoo Creek. It was steep and rocky, and knees were giving me curry, but I could see that both wombats and pigs had been there before me. In my youth, when I was the national park ranger for this swathe of mountains, I had been silly enough to suggest (in writing!) that feral pigs seemed to be making little headway and perhaps it wasn’t good country for them. I’ve never lived it down. 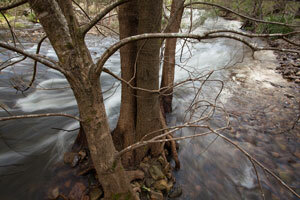 Arabanoo Creek: multi-coloured stones, pure water and white petals of sassafras. There were stinging nettles and native raspberry too, lest I be accused of being too starry-eyed. And cedars, their bare deciduous branches reaching up into the wedge of sky above the creek-bed - survivors of some of the last cedar-logging in NSW. A lone river oak soon told me it wasn’t too far to the Kowmung. Travel was easy, but the creek courses back and forth all over the shop through convulsions of quartzite. It never takes just one kilometre when three will do. Once, we followed it all the way down from Kanangra Walls. We thought we’d never get to the end; it took the whole bloody day. This time, I was exhausted, which was a worry. I passed some gorgeous groves of moss-cowled rocks and myrtle, too late for a photo stop. Something for next time. Christys Creek joined in, then the river. I crossed quickly, knee-high but spine-chilling, and hurried along the easier bank. I wanted to get near Sunrise and Sunset Bluffs before camping, for obvious reasons, even though sunset was already lost to me. 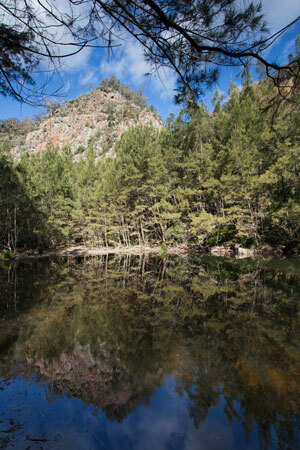 Once before I had tried to traverse Bulga-Denis Canyon, the long middle gorge of the Kowmung. I came in summer, the quick way, straight down Cambage Spire to the Christys junction, inflated my airbed and floated gaily down. Until a sharp stick poked its nose in. My craft was unrepairable, at least then, and there. I packed the useless slug away and began scrambling along the gorge. It was difficult. A thunderstorm moved in and the rain came down. It never stopped. The rocks were incredibly slick. I looked at the map, climbed up the next spur, over Great Stony Mountain and all the way back to the car before dark, with a four-day pack and wet airbed, still raining, utterly spent. Decades passed, but I was finally back. As the river turned against a mammoth cliff on one side, I realised I was near the point where I’d come unstuck before. Light was fading. I crossed to the easier side and hobbled sore feet along some steep rocks. At least the slabs were dry this time. Then I struck an impassable bluff. I wasn’t about to start swimming. Across the deep river, it looked like it might just be possible to squeeze along the base of the cliff, with some hard climbing. I walked back towards a rapid and camped on a patch of grass, despite the chiggers. I began to wonder if I could handle another 10 km of this. But in the morning, after a crossing, a wade along the cliff and a short but strenuous rock traverse to keep out of deeper water, the going eased off. For two short days the gorge was an enjoyable mix of travel. One minute I’d be scrambling through cuboid rocks filigreed in grey lichens, then striding along open flats of native meadow grass. No blackberry – the national parks people deserve credit for a rigorous control effort. The vegetation was remarkably nice. The trees were a menagerie of form and colour: forest red gum, rough-barked apple, river oaks dappled with green lichens, forest oak, water gum, grey myrtle, sandpaper fig, red cedars, native peach, and occasionally the staunch pillar of a kurrajong. Each species with its own distinctive character and preferences, sometimes gathered together with others of their kind, elsewhere mixed up in a multicultural melee. Some of the oldest water gums showed deep history: massive burly boles topped by a spray of young branches, every previous effort at upward growth smashed off by the floods. I was only forced to climb high once, caught out on the wrong side with no way down to a crossing. But the wombats saw me through. I guess they don’t like to swim either. A good pad, strewn with regular droppings as reassurance, led up and up and then (seems they too don’t like to climb higher that they have to) along sneaky ledges between bluffs, then slowly down again. It was too easy. Then I came to a burrow. The trail ended. I had to bumble my way back down to the river without marsupial guidance. The gorge was rich in photographic opportunities. I could barely pick up my pack and regain my balance before another fine scene would appear. It was a challenge to make any progress at all, so it was just as well I only planned to go a few kilometres each day. The river crossings, which I managed to limit to about nine, were cold enough to freeze all the nuts off the Sydney Harbour Bridge. I never saw an actual wombat, but if pads, burrows and droppings were anything to go by, they were there in their dozens, holding their own against the pigs. I wondered how they were coping with the chiggers. Once in my perambulations as I came back down to the river’s edge there was a horrible black beast splashing in the water. A bunyip! Then the confused shape formed into a floundering swamp wallaby, and I don’t think he was having a bath. Maybe the chiggers had driven the poor thing insane. More likely it was me who had scared the daylights out of it. The wallaby splashed along the shore and struggled to clamber out again, as wet and slick as a seal, its limbs poorly adapted to climbing over boulders. Later, close to dusk, I was happily chugging along a wombat pad when two burly wallaroos came bounding straight for me along the track, one after the other. I was afraid I’d be stomped into the ground, until they veered off at the last moment, like spooks from a ghost train. My last morning on the river was soft, muffled. The sky was overcast and not a leaf moved. The ferns and grasses glistened from overnight showers. I went to work early anyway, in case the sun broke through. I was taken by a pattern of slowly-moving swirls of white foam on the darkness of a backwater. They kept changing shape, and so the compositional effect, so I sat and watched for a while. The only sounds were the main river rattling nearby and a lyre-bird going through its songlist. I’ve always felt there’s something mystical about a river: its vitality as the fluid of life; the way it speaks of the country it has travelled; the dynamism; how the water is always moving and yet looks the same. But it isn’t. Each constituent rapid and eddy is constantly changing its shape, even though the accumulation of all those movements is to sustain the same downstream flow. After a while I could see that every now and then some more interesting swirls spun through the eddy. I set up the camera, waited, and took my chances. 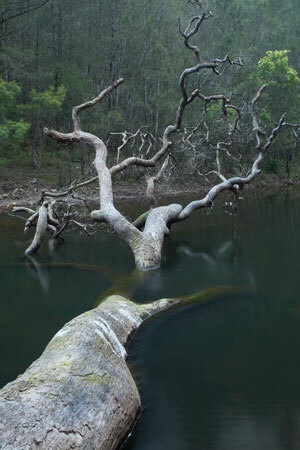 Next, a fallen angophora caught my eye. It had toppled across the river, almost reaching the far side of a silent pool. Lifeless, leafless and bleached, it revealed the curling branches so characteristic of the species better than any living tree could. One attenuated limb scribbled skywards like a skeletal fingerbone. Despite my photographic activities, I managed to get away before ten. It would be a hard day, hauling back up to the plateau. Just the first rise, up to the old cattle track on the crest of the Gingra Range, was 600 metres. 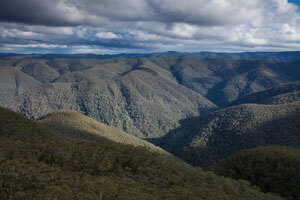 Kanangra Tops was another 200 metres higher. With a few dips and dives along the way, it would be near enough to the tonne. Still, the gentle Roots Ridge is one of the easiest spurs out of the river. And there’d be no chiggers up there. I set off up the hill at a pace I hoped I could keep to the whole way - as long as I took a few rests. It was not fast. A cheerful pardalote helpfully chirped out the metronomic rhythm of my plod. I found no track at first, but it showed up as the spur narrowed to the spine of a tall bluff falling straight to the river. Myles Dunphy wrote that the only track worth walking on was one that brushed your legs. I guess it depends on what’s doing the brushing. Here, the track was just a pad of crushed gumleaves winding through a thick sward of grass. The Kowmung valley is its own rainshadow between the high country all around, and the lowers slopes are a delightful, semi-arid forest of red gum and ironbark with almost no scrub. I dropped my pack and went to the cliff’s edge. A grand vista of the river appeared. Its path through the gorge could be seen wriggling around lower spurs within the larger valley, still cutting its way into the hard rocks. The dull grey crowns of forest red gums stood out, and here and there the yellow splash of flowering wattles. Soon the rock orchids would be sending out their own flower spikes. The pig churnings were invisible. River time is not human time, which is a comfort. The river will go on, flowing and changing. The scene was compelling, but the light was flat, and I’d used up all my film. I swung my pack up, smelt the hot, sweat-soaked canvas, and turned back up the hill. Some places, you just have to go back.